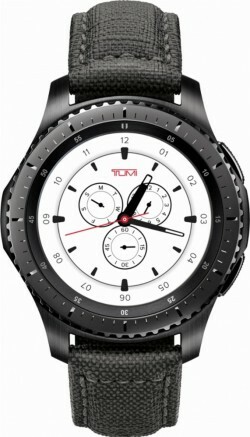 Tumi has collaborated with Samsung to release a Tumi edition of the Samsung Gear S3 Frontier. The most notable differences are: a custom-made Tumi watchface that is preloaded on the wearable, and a TUMI watch band made from Italian canvas. While not the most elegant material out there, the canvas watch band changes the overall look and feel of the smartwatch. The band is earl grey-colored which matches the tone of the Fronteir pretty nicely. The band also has a stainless steel fastening buckle. Samsung also says the canvas band is also resilient against the elements, so feel free to use it while hiking through the dirt or biking through the desert. The Gear S3 Frontier Tumi edition is $449 in stores, $100 more than the standard Frontier version. Though, Best Buy is currently selling the Frontier for $299. don't get me wrong it looks nice but no where near $100 price hike, thats insane you can download watch faces that look like that or better and as for the strap i doubt that worth $100. so why the hike ?? ?